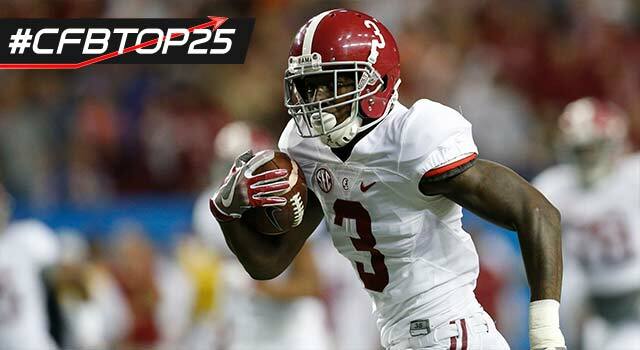 Calvin Ridley earns his way into the #CFBTop25 countdown for the second consecutive year and is one of just four players to do so. The junior is arguably college football's top wide receiver. NFL.com analyst Bucky Brooks has likened him to former Colts great Reggie Wayne. Ridley's production dipped a bit in 2016 as Alabama broke in a true freshman at quarterback who was a little hesitant to take deep shots down the field where Ridley, an explosive playmaker, can thrive. He could post huge numbers in 2017 now that Jalen Hurts has a year of seasoning under his belt. Ridley was selected to the preseason watch lists for the Maxwell and Camp awards, which go to college football's top player. Ridley received votes from four of seven CFB 24/7 experts, with two analysts placing him at No. 13 in their rankings. He's the highest-rated wide receiver in the #CFBTop25 countdown and in CFB 24/7's "17 for '17" series, Ridley was rated No. 8 on the list of offensive players most likely to become NFL stars. Where do fans rank Ridley? We asked Twitter users who they considered the best player in college football. Ridley didn't receive a vote. It's surprising that he didn't receive any fan support, considering he's one of the top players on the most high-profile program in college football. It might be related to the fact that his production dipped a bit in 2016 (89 catches, 1,045 yards, 7 TDs in 2015; 72-769-7 in 2016), but he remains one of the game's top talents.